Make sure you watch to the end so you can enter to win up to $250! That's good shoe money, y'all. How about you? Does warmer weather make your hair go crazy, or do you look forward to the heat and humidity? Those styles are lovely. I used to have the same summer hair problem until - I know this sounds gross - I switched to the no-shampoo method outlined in the book Curly Girl. Years of desperation drove me to it, and after a couple of uncomfortable weeks, it turned to MAGIC. I used to use Devacurl products, but now I am all hot for Jessicurl's Hair Cleansing Cream. Summer's got nothing on my superconditioned hair now! YMMV but might be worth checking out. My hair is dry, coarse, and wiry. I can also recommend some superthick conditioners if you think they might help. I actually JUST got a travel set of the DevaCurl no-poo, conditioner, etc. I am excited to try it! I'm with you - my hair is insane in summer, but I love the sunshine and warmth and dresses and cute shoes so much I am wiling to try to deal with the hair situation. 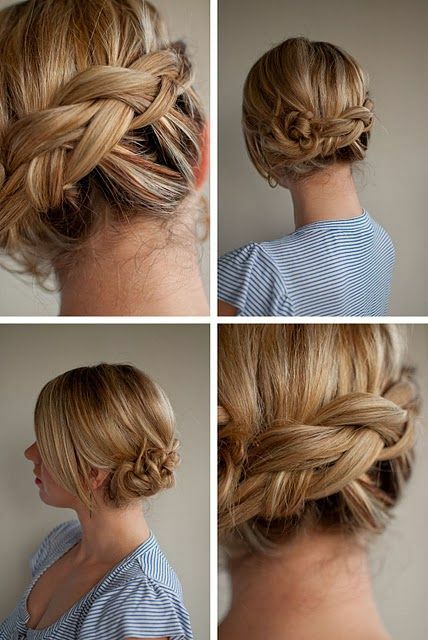 Braids are such an easy way to create a "hair do"! I have straight hair, so wether I leave the braids in or take it out for a crimped look, braids are a versatile go-to style, from formal to casual occasions. It will never go out of style for me! Adrien: What I Keep At My Desk. Up for another round of Jumpy Ball? We Never Stop Yapping About This Stuff. A PIG IN A BUSHEL.